Georges Gaudy. 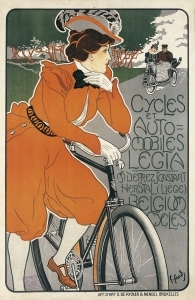 Cycles et Automoviles Legia, 1898. Henri Cassiers. Red Star Line, 1898. Anonymous. 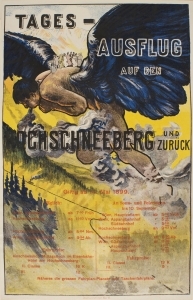 Tages-Ausflug auf den Hochschneeberg und Zurück, 1899. The society of the end of the 19th century didn’t hide its fascination for machinism. From the 1850s onwards, the universal expositions made room for the power of human ingenuity, with the desire to subdue nature. This attraction for the idea of technical-scientific progress was directly reflected in commercial art. 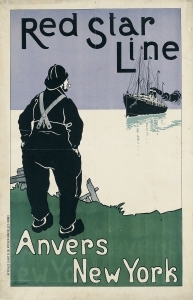 Many of the posters from the collection make the impact caused by the means of locomotion visible. 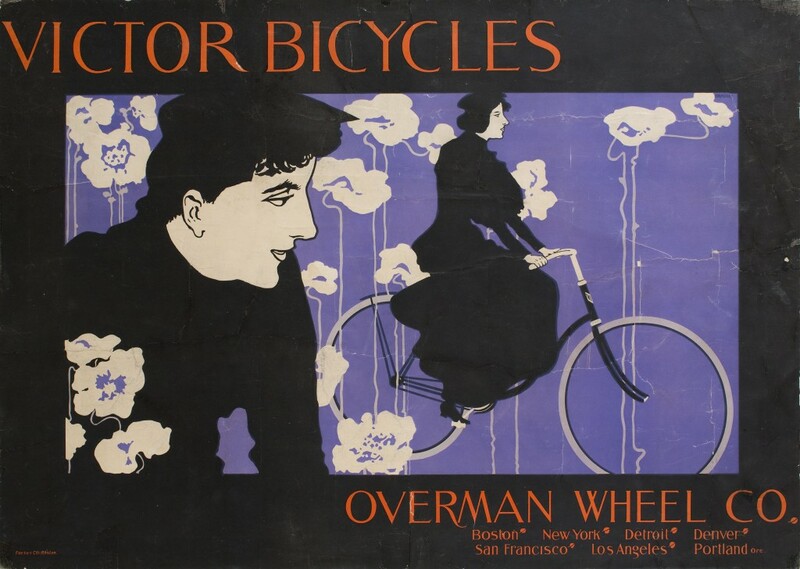 As a result of the major social boom, due to the extension of its use, both public and private, the bicycle and car manufacturers, the shipping and even aeronautical companies used posters to spread their products. William Henry Bradley. Victor Bicycles, ca. 1896. The images of these posters also highlighted the practice of sports competitions, as the motor races and the regattas were a very extended habit among the bourgeoisie with a high level of purchasing power and with a desire to project an image of a certain social status. Ramon Casas. Real Automóvil Club de Cataluña. 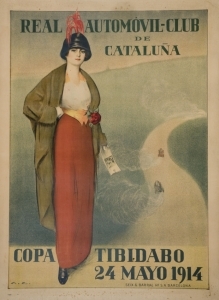 Copa Tibidabo, 1914. Joan Llaverias. Real Club de Barcelona, 1902. Today, contemplating some of these models of antiquated automobiles, somewhat uncomfortable, designed without much aesthetic criteria and apparently unsafe, they no longer cause us the surprising effect that they must have done when they first appeared. The ironic or even suspicious look with which the poster makers of the time contemplated these mechanical gadgets, as if there were infernal machines, gives you an idea of the major social repercussion that this new phenomenon had. However, the sensation of speed that the compositions transmit to us, is still based on a conventional use of the figurative repertoire. In fact the main novelty is not so much in the form of the message but in the content. The authors used a very popular visual language, close to the sensitivity of a public used to reading illustrated magazines, in which the graphic support, cartoon strips and jokes, was socially very extended. In this way, it predominated the tendency to represent comic situations, in which the consequence of the advent of the automobile would be observed with irony and cartoonish strokes. At the end of the day, it’s worth remembering that in its origins the advertising poster was received with great enthusiasm by part of the critical opinion that celebrated the appearance of a popular and close artistic language, of diaphonous reading, and whose comprehesion didn’t require a major cultural background. Ramon Casas. Cyclist. Return trip, ca. 1890. Georges Gaudy. Automobile Club Belgique. 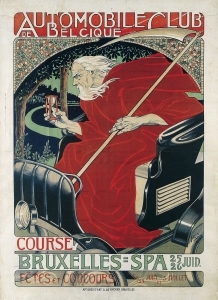 Course Bruxelles – Spa, 1898. Some years later, the appearance of the futurism, accompanied by an ideology that proclaimed the advent of the new technological civilisation, brought with it the break from the preceding visual paradigm. Moved by the desire to emulate the internal logic of machinism, whose perfection had been achieved thanks to the efficacy of the manufacturing system of assembly production chains, the futurists rejected the previous artistic language, because it preserved the traditional system of representation and maintained the fetishist aura of the work of art. 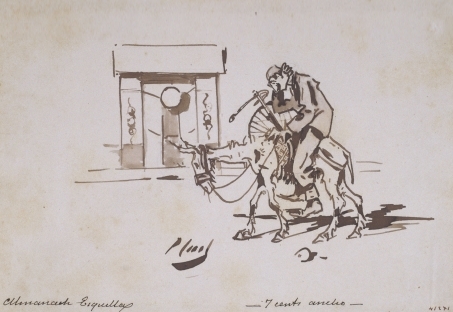 Catalan graphic art, as exemplified by the works of Alexandre de Riquer or Ramon Casas, far from showing an attitude of resistance to the appearance of the automobile or the bicycle, also contributed to the appearance of this iconography. More specifically, we owe it to Casas for two of the most emblematic posters of the time, which became two of the most popular icons of the modernist Barcelona. Conceived as a mere amusement and associated with the decoration of the bar Els Quatre Gats, both Ramon Casas and Pere Romeu on a tandem as well as Automobile, constituted two examples of the subversion of the hierarchy of genres, the power of recognising a current of exchanges and figurative loans between the painting and the poster. 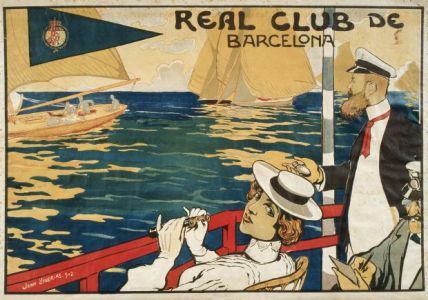 Few works sum up better the benefits that the appearance of modern posters represented for Catalan pictorial practice. Ramon Casas. 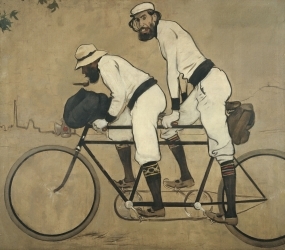 Ramon Casas and Pere Romeu on a Tandem, 1897. Ramon Casas. 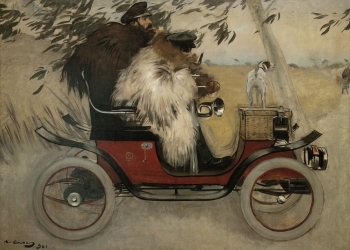 Ramon Casas and Pere Romeu in an Automobile, 1901.